AlbumCreator lets you create online albums from your digital photos using unique and highly professional Flash and HTML theme templates. You can customize the existing templates, create your own or download additional ones. The program also includes editing tools to enhance your photos, remove red eye, adjust colors, apply watermarks and more. Album Creator Pro includes a simple FTP client that lets you upload the finished album to your web site. 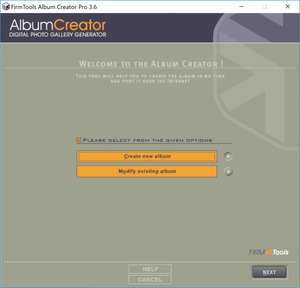 Album Creator Pro 3.6.603 is a shareware program and can be used as a demo to try the software until the free trial period has ended. A full version of the program is available after the trial period ends. For security reasons, you should also check out the Album Creator Pro download at LO4D.com which includes virus and malware tests. Additional screenshots of this application download may be available, too.